The 1860s, the end of the American Civil War. 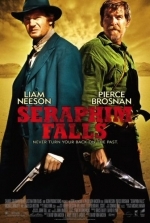 Gideon (Pierce Brosnan), deft and experienced with a knife, is hiding in the American Rockies. Eventually, several mountain men, hired to hunt for Gideon, shoot and wound him. It appears that the hunt was organized by Colonel Morsman Carver (Liam Neeson), a Confederate officer who has been long craving for getting even with Gideon... But what is his sin? - Never turn your back on the past.